This recommendation follows the surveying of Breton Bay in St. Mary’s County – the department’s initial restoration recommendation in December 2017 – which found no live oysters, no dead oysters and very little remaining oyster beds or shells among the tributary’s muddy and sandy bottom. Poor dissolved oxygen levels and lack of suitable bottom were also factors in recommending the Manokin. Working with the Interagency Oyster Restoration Workgroup, Oyster Advisory Commission, county oyster committees and other partners, the department will restore the tributary using state funds. The restoration work would occur in deep water to avoid any public safety and navigation hazard to anglers, boaters and commercial watermen. The department will engage local watermen in field work, plantings and surveying. If selected, the Manokin will join Harris Creek, Little Choptank, Tred Avon and Upper St. Mary’s as the state’s large-scale oyster restoration tributaries. The Chesapeake Bay Watershed Agreement set a goal of restoring oyster reefs and populations in 10 Chesapeake Bay rivers – five in Maryland and five in Virginia – by 2025. Along with its restoration selections, the state is also moving forward with studying and surveying existing state oyster sanctuaries in Anne Arundel County, including the Severn River Sanctuary, where 40 million oyster spat were planted in 2018 using state funds, as well as 5 million using private funds. 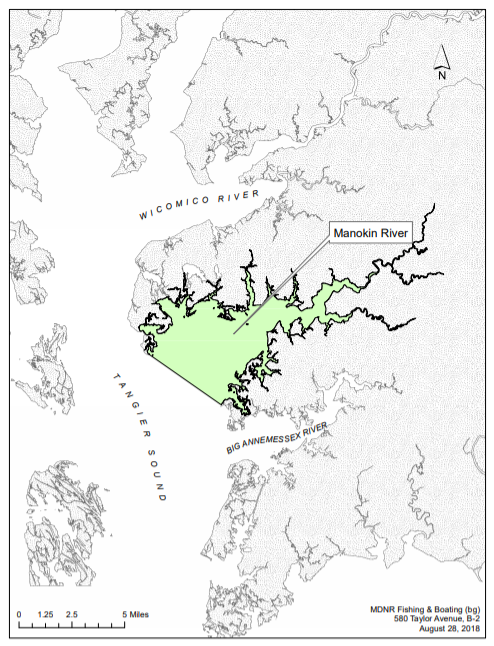 Additionally, the department has pledged to work with partners, including the South River Federation and Magothy River Association, to maximize restoration potential in those Anne Arundel County tributaries.